Want to know a secret? I stash glossy magazines under my bed. And sometimes, late at night, I pull them out and let my fantasies run wild. Do you do it too? You know the ones I mean. The naughty catalogues taunting and teasing you as they spill out of the mailbox: Restoration Hardware; Pottery Barn; West Elm; and the incongruously named Design Within Reach, (not within my wallet’s reach, friends). The tables, bookshelves, lawn and patio furniture whisper like Greek Sirens from the Rocks of Financial Ruin: “Oh look at me, look at me – aren’t I pretty ?”. You want them. You need them. They make you ache inside. Then, you take a peek inside your checkbook and you know you can’t have them – four thousand dollars has three zeros Michaela, not two. Those beautiful designs are not within reach – or so you think, (well, so I thought, anyway). 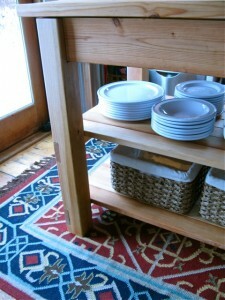 Then I stumbled upon Ana White, and her brilliant blog, Knock-Off Wood. Suddenly, I found myself shallow-breathing. OH MY GOD, I can make these things myself? Where have you been all my life Ana White? But I am getting ahead of myself. What does this have to do with The Gardener’s Eden, right? Time for some back-story. So, it’s winter. Yes, (go ahead, roll your eyes), you know that. And if you read this blog regularly, you also know that I really like to make and do things. This urge to create is long-standing. First I tried to build a fort from a dishwasher crate when I was a kid, (sad, but true). Then I moved on to a tree house, (dismal failure). You see, my dad is an amazing gardener, but he’s never been much of a carpenter. And my mom is great with sewing and knitting, but I am not so sure she is familiar with a jig-saw. So, along the way to adulthood, I found myself picking up a little bit of this and a little bit of that in high school wood-shop class and from handy boyfriends. Gradually, I learned a few basic carpentry skills, and eventually I picked up some power tools and a passion for homemade things. I assisted with building various structures, from raised vegetable bed planters to rose trellises and even a garden shed. I was hooked. Then, my crafty compulsion blossomed into full-blown, do-it-yourself mania when I bought a piece of land, and designed and built my own studio/home. As the general contractor on my building project, I learned a great deal about how things work. And, I was fortunate to find a team of carpenters willing to let me work along side them, (thanks guys)! Yes. I have had a bit of experience building things; big things even. But until last week there was one thing I’d never tried to do: design and build a piece of furniture. And boy do I really, really need furniture. Fortunately, I regularly read, (and adore), a blog called Young House Love. 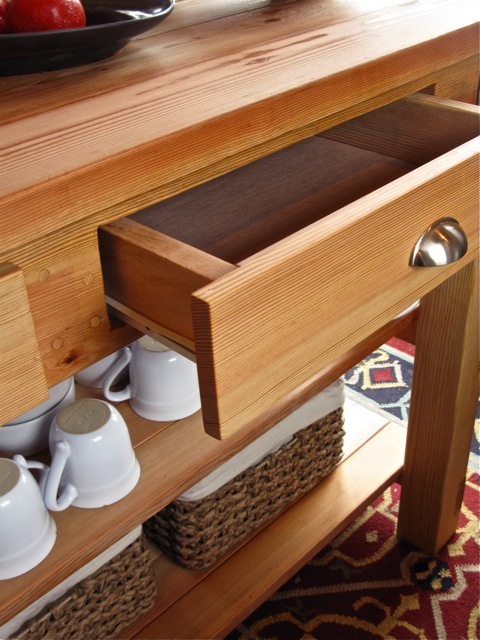 A few months back, authors John and Sherry featured a do-it-yourself furniture making site called Knock-Off Wood, written by the generous and talented Ana White. A stay-at-home mom and homemaking Alaskan, Ana describes herself as “obsessed with furniture”. And lucky for her readers, she definitely is! Yes, take one look and you are sure to notice that Ana is beautiful, but she’s a lot more than meets the eye. Ana is smart as a whip, (I think she’s a complete math whiz), and she is also one talented carpenter and furniture designer. Plus, her blog is ultra-approachable, tons of fun and easy to use. But here is the best part of her blog: she posts self-created building plans for some of the most coveted, name-brand furniture items… for free. The woman has single-handedly restored my faith in humankind. You must visit her site, even if it’s just to dream. Ana considers our moral support, (spread the word), our thank you – and it’s also her motivation. 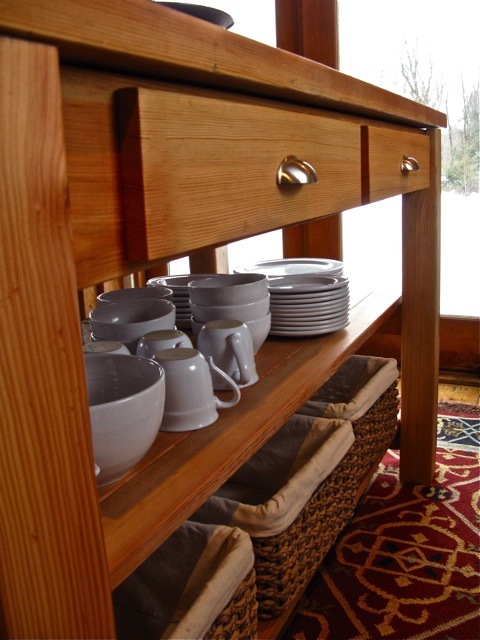 So now, this brings us back to my kitchen island, and to last week’s three-foot snow storm. 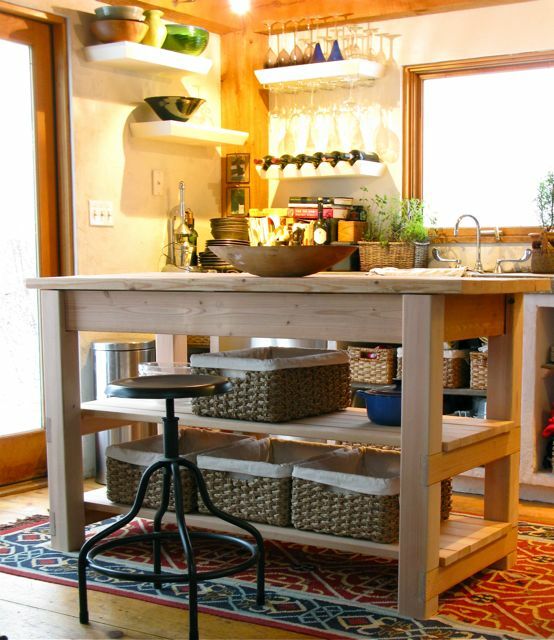 Take another look at that farmhouse-style kitchen island at the top of this post. That island, (minus the two very handy drawers and added middle shelf), retails for nearly $3,000 from a certain catalogue company. 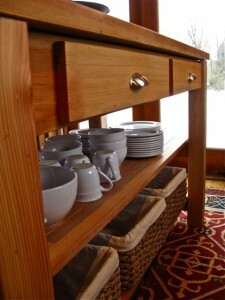 Want to know what it cost me to build, (using sustainably grown and harvested douglas fir)? Just $165. Yes, you read that right. One hundred and sixty five dollars. That’s less than the cost of shipping and handling, and/or tax on the original, RH-inspired item. Ana posted two designs on her blog, and I fused them into one. The dimensions and basic building plan was taken from Ana’s W.S. inspired kitchen island design and the salvage-style and construction details were taken from Ana’s R.H. inspired farmhouse table. This island took two days and two sets of hands to build, (thank you Billy!). Warning: it’s not a beginner project. But plenty of the beautiful furniture plans on her site are suitable for beginners. 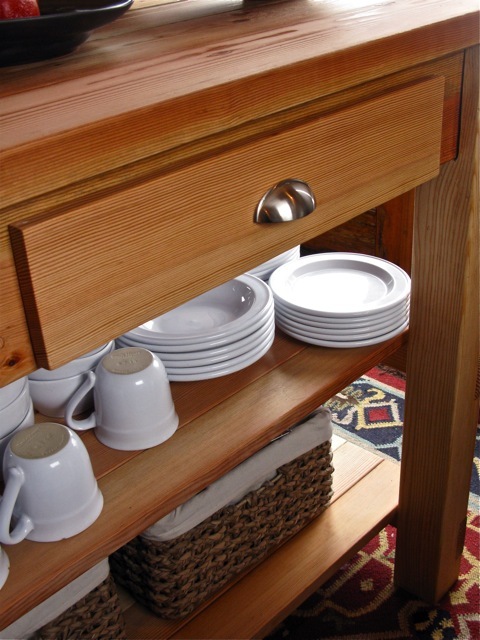 Ana has created a “bragging board” and “suggestion board” on her blog and on her Flickr® site, (this island, and many other reader-built projects are featured there), where you can find and/or upload home-built examples of her plans. So, just to bring this full circle – Ana has really inspired me to get on some garden-related building projects to help The Gardener’s Eden’s readers. Some of you will remember that late last summer I posted plans for home-built hoop-house cold frames. Basic carpentry skills and building projects can really open up your gardening options, (think vertical, retaining, etc.). So what’s up next? Well, hopefully there will be project plans for trellises, planter boxes, raised beds, potting benches, outdoor furniture and more. Yes, I have some big ideas. And if Ana posts anything for use in the great outdoors, you bet I will link it here for you, because The Gardener’s Eden is a huge fan of Knock-Off Wood. Thank you Ana White of Knock-Off Wood ! Article and Photographs © 2010, Michaela at The Gardener’s Eden. All rights reserved. You are currently browsing entries tagged with easy building projects for garden and home at The Gardener's Eden.